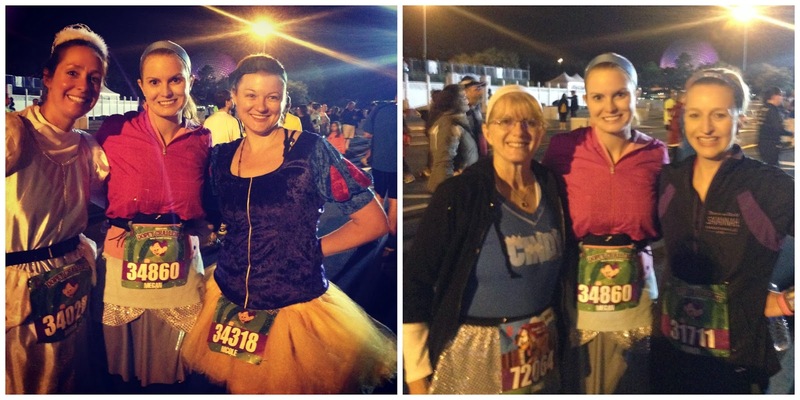 Hello from Disney World :) My alarm clock went off at 3:45am this morning for the 2014 runDisney Family Fun Run 5K. I may have gotten 3 total hours of sleep last night, following insomnia Tuesday where I racked in 4 hours. We both ended up wearing jackets during the entire 5K. All bundled up, we found our way to Epcot and found my co-workers friends, Michelle and Nicole along with Gabe's Aunt Karen. Michelle, who has ran a marathon in every continent and every state is the one who convinced Nicole and I to sign up for our first 5K two years ago. Nicole has been my running partner since day one. Karen, who ran Boston in 2012 has been a constant motivation for our family. My Mom ran her first official 5K this morning and I couldn't be more proud. I love these ladies! My only goal for the 5K was to walk as much as possible - the next four days are not about time, it is about finishing 48.6. Ideally, I would have liked to walk the entire 5K today, stopping for every character photo opp but that didn't happen. Mom and I were in Corral D so by the time we got into Epcot, the lines for each character were extremely long. Dopey was located inside of Germany and his line had to be an hour long. I guess the 7,000 Dopey runners wanted their photo with the man who made us all lose our sanity when we signed up for this race. Sadly, we didn't get any photos with characters this time around. There's always tomorrow! I did however get a cute photo of Remy in France. Now looking back at this photo, I wish we stayed in line for them. While Mom and I did not get any character photo ops, we did get lots of photos with the Epcot ball. I love this photo except Mom's eyes are shut. Her name is Cindy by the way and she proudly wore her "Cindy" Cinderella shirt by Raw Threads. As we rounded mile three, it started raining pretty hard and had the hoodie of my Brooks Pure Project Running jacket on until we crossed the finish line.I didn't take nearly enough photos of this race due to the rain. I do have to say, I love the runDisney 5K course. It is mostly through Epcot and it feels like 1 mile vs. 3 miles. Tomorrow's 10K course is similar. Mom and I walked over 90% of the 5K and I learned she has a very small bladder, stopping 4 times for bathroom breaks. Tomorrow's 10K shall be interesting if this trend continues. We will also walk the majority of that event. Jeff Galloway has strongly suggested that Dopey runners walk tomorrow's race and most of the Half Marathon. While I am normally a slow runner, this four day adventure will be slower than normal for me. So what do two girls do with no character opps? Head over to Magic Kingdom :) It was raining there too. We only had time to catch up with Mickey Mouse, who tried to steal our medals. Speaking of stealing medals.......I don't think so Dopey! We had a fantastic time this morning on my first of four days running through Disney World. I am looking forward to participating in the inaugural Walt Disney World 10K and cannot wait to get my hands on that Minnie Mouse medal! 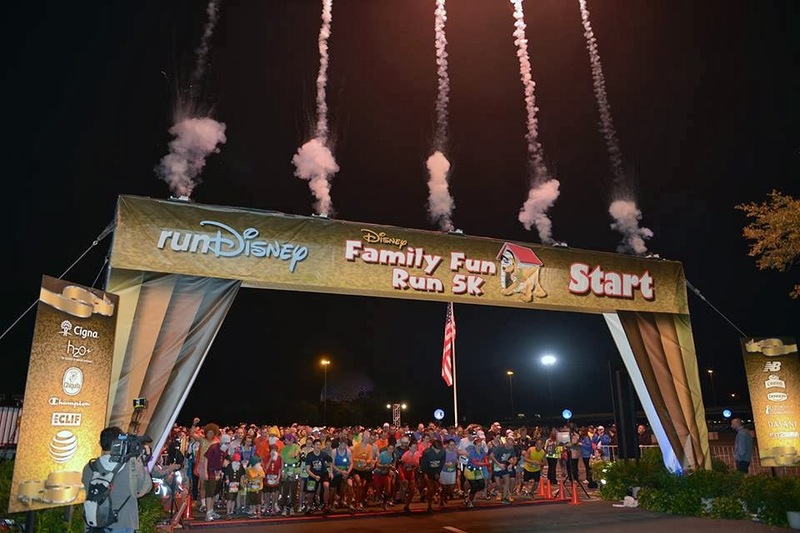 You can follow the four days of events with hashtags #WDWMarathon, #WDWHalf, #WDW10K, #GoofyChallenge, #DopeyChallenge and #DisneyFunRun5K. Great recap!! The Royal Family 5k was what inspired me to start running last year. I agree that the course around Epcot is so much fun. Good luck the rest of the weekend! Enjoy it!! I'll be volunteering on Sunday cheering all of you Dopey runners at mile 12.9. That's awesome hildy!!! Thank you so much for volunteering. The volunteers are who make this race! You & your Mom look so cute! !